Patients who walk into one of Appletree Medical Group’s private clinics in Toronto and Ottawa, Ontario, Canada have a choice. They can either sit down and wait an hour or more to see a live, in-person doctor. Or they can cut their wait by being treated by a two-way telemedicine link. Using telemedicine, E.R. doctors in remote locations can get access to top-flight specialists quickly and easily.If the patient chooses the telemedicine option, they are taken to a room equipped with a videoconferencing camera, monitor, and microphone. 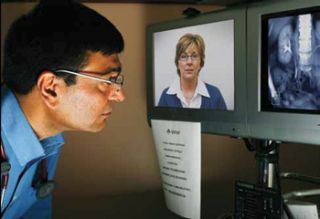 The patient is then connected with a telemedicine assistant (TA). The TA—typically a nurse or doctor in residence—remotely records the patient’s medical history on an electronic medical record (EMR). Physical symptoms like rashes or bruises are capture with a high-resolution camera. There’s also an electronic stethoscope that lets the TA hear the patient’s heart beat and breathing. Blood pressure can also be taken and transmitted, and other tests ordered. When all this data has been recorded, the patient is referred to a doctor for the telemedicine diagnosis. Once the consultation is over, the doctor can prescribe medicine, with the prescription being printed electronically at the local Appletree clinic. The patient can also be sent for further tests, or referred to a local hospital, all without actually seeing the doctor in person. Geography is a driving force behind OTN. Ontario is a huge province that covers some 400,000 square miles. To put this in context, it’s the size of Texas and California combined. To make matters worse, 12 million Ontarians live close to the U.S. border in the south. The remaining one million are scattered across the province—often in rural and remote communities too small to support specialized medical care. To take the Texas/California analogy further, it is as if 12 million potential patients live in the Los Angeles area, with the remaining one million scattered throughout the rest of the combined states. This is why telemedicine has been embraced by the Ontario government. And its acceptance is growing: In 2011/12, OTN delivered care to more than 204,000 patients and expects that to grow another 50 percent this year. In a far-flung territory like Ontario, telemedicine makes sense—but only if it is deployed in a consistent, interoperable and standards-based manner. This is where the Ontario Telemedicine Network comes in. As one of the largest telemedicine systems in the world, it manages the de facto network that links together its membership. Besides managing Ontario’s telemedicine network—and acting as traffic cop to keep things running smoothly—OTN sets equipment standards for its users. To prove the validity of telehomecare, OTN recently tested at-home treatment of more than 800 patients with Congestive Heart Failure or Chronic Obstructive Pulmonary Disorder. The results were impressive: Among the group being treated using Telehomecare, there was a 65 percent reduction in the average number of hospital admissions; a 72 percent cut in the average number of Emergency Room visits; and a staggering 95 percent reduction in the average number of walk-in clinic visits. Based on these results, OTN is currently planning a much broader roll out of the program. “In the telemedicine arena,” OTN CEO Dr. Ed Brown says, “we’re not just a network provider and standard-setter, we’re a matchmaker.”OTN has also launched an Emergency Services Program. This program supports Emergency Rooms in smaller hospitals, where there may not be physician expertise available to support complex emergency care—such as acute stroke, burns, or multiple trauma. Using telemedicine, E.R. doctors in these locations can get access to top-flight specialists quickly and easily. This enables improved patient care and potentially fewer patient transfers to larger urban hospitals. Telemedicine will not replace every kind of in-person medical assessment. But it may improve wait times for patients while reducing the costs and time associated with traveling for care. Meanwhile, for those one million Ontarians not living along the Canada-U.S. border, telemedicine could radically improve the quality of health care they currently receive—and eliminate the need for costly, timewasting travel. So how much could telemedicine save Ontario taxpayers? Well, $48.7 billion has been allocated for healthcare system in 2012-2013. That is over 38 percent of the province’s total budget. Given that Ontario is trying to cut its current $15.3 billion budget deficit, anything that can reduce the amount spent on health care while maintaining the quality of care is a welcome option. James Careless is an Ottawa-based writer who covers audio and video developments, as well as the business of technology. Reach him at jamesc@tjtdesign.com.